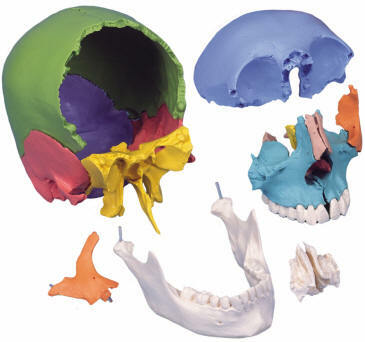 Identical to the above, but individual bones are not color coded. All are in natural bone color. 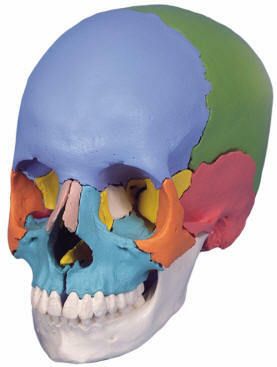 This skull model is especially useful to demonstrate the specialize role of the atlas and axis. 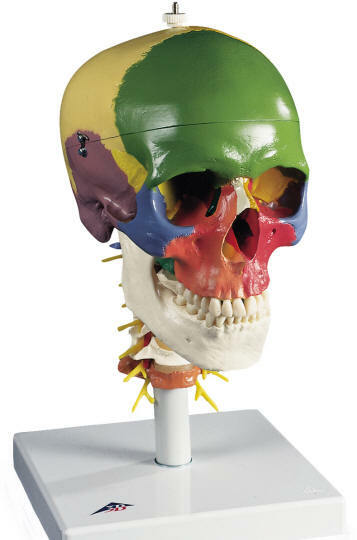 It uses 19 didactic colors to demonstrate the shapes and relationships of the various bone plates of the skull. Flexibly mounted on the cervical spine (C1, C2 and C7 are color), this model also exhibits the hindbrain, spinal cord, spinal nerves of the cervical spine, vertebral arteries, basil artery and rear cerebral arteries. Disassembles into 4 parts. Mounted on stand.